Alex Navissi has won two games from behind. What will he do on his third night? Unless Gautam wagers improperly, Alex’s run will end tonight; he has less than the difference between first and second. Uh… what the hell? That’s the dumbest name I’ve seen in a long time. Just call it “SCULPTORS” or something. If Cindy doubles her score, she’ll have 24,400. 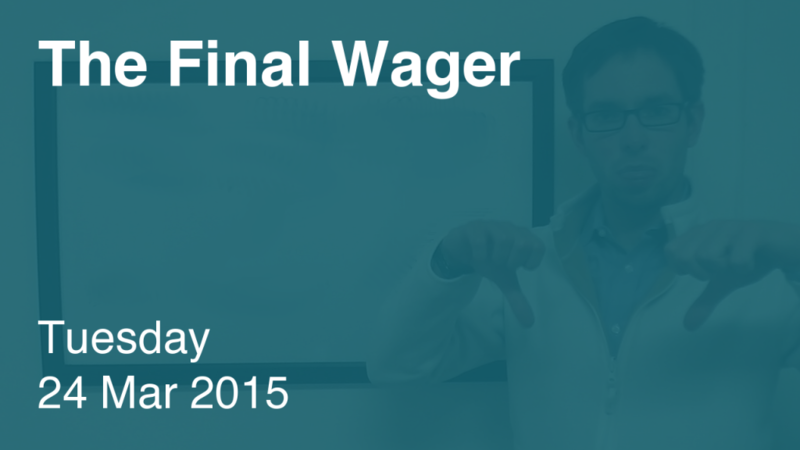 To cover this all-in wager, Gautam will need to wager 5,600. An incorrect response with that wager will leave Gautam with 13,200. To get above his total, Cindy must wager at least 1,000, so we’ll make that everything. A successful doubling will put Alex at 12,400, so Gautam could wager at most 6,400. Here’s where things stand after the first order; we don’t need to go any further. Good wagering from Gautam, master of the index-finger buzzing. We’ll see if he can start a run of his own tomorrow. If this question had occurred during the game, Alex probably would used an Italian accent. Love your site. Checked it out before I went on. BTW it’s Garner. Thx! Keith, Cindy’s last name is Garner, not Gardner.